Hey there! Hope you had a great weekend! I've been hard at work in our kitchen finishing up a few smaller projects. 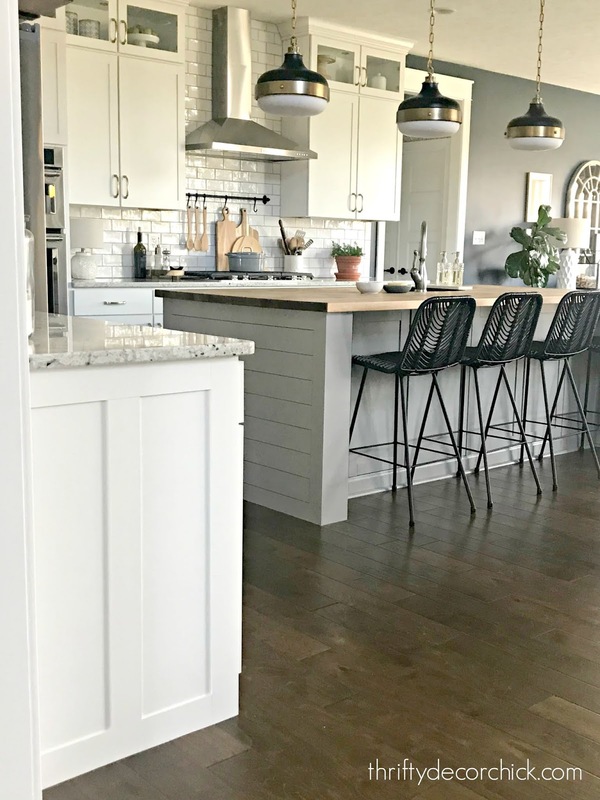 I LOVE our kitchen, but I've planned all along to add some small details that add some interest and character. 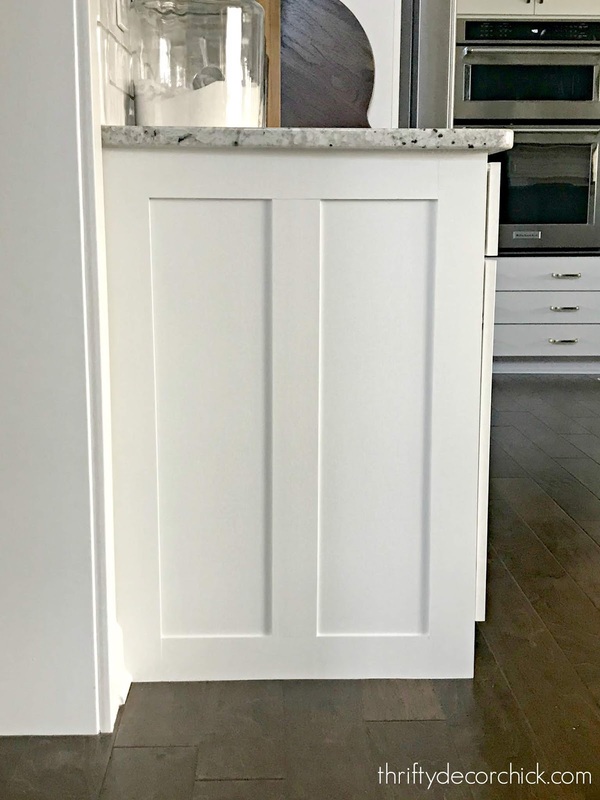 Basic cabinet ends don't bother me -- but I do see them as an opportunity to make the kitchen feel more custom! I considered a bunch of different looks, but in the end went with the simplest design. 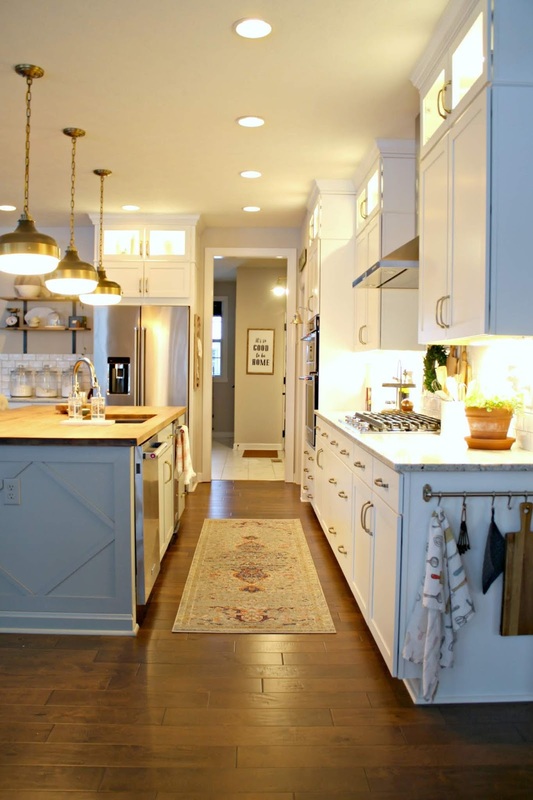 My friend Jenny shared a bunch of great options for dressing up the ends of cabinets here. 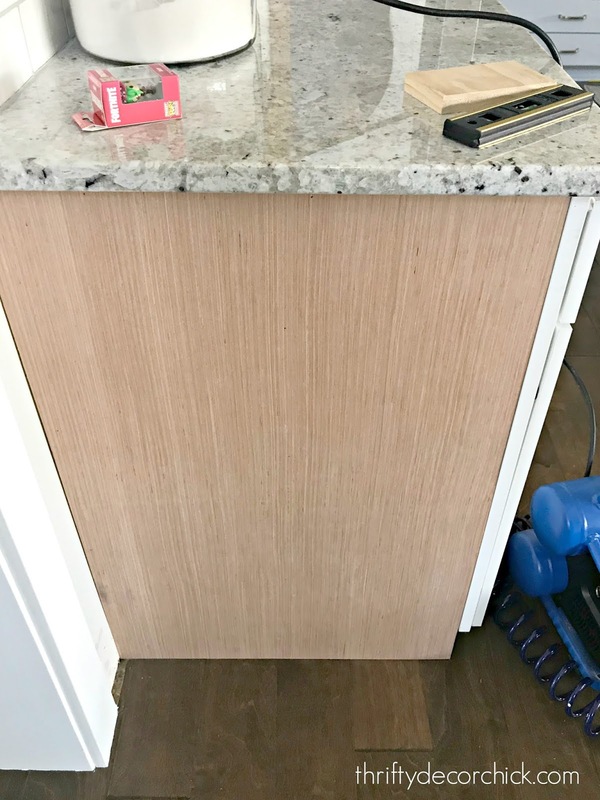 First I had to remove all of the trim along the side -- the quarter round, baseboard on the wall and the trim along the back of the cabinet. I used a pry bar and my hammer to pull those off. 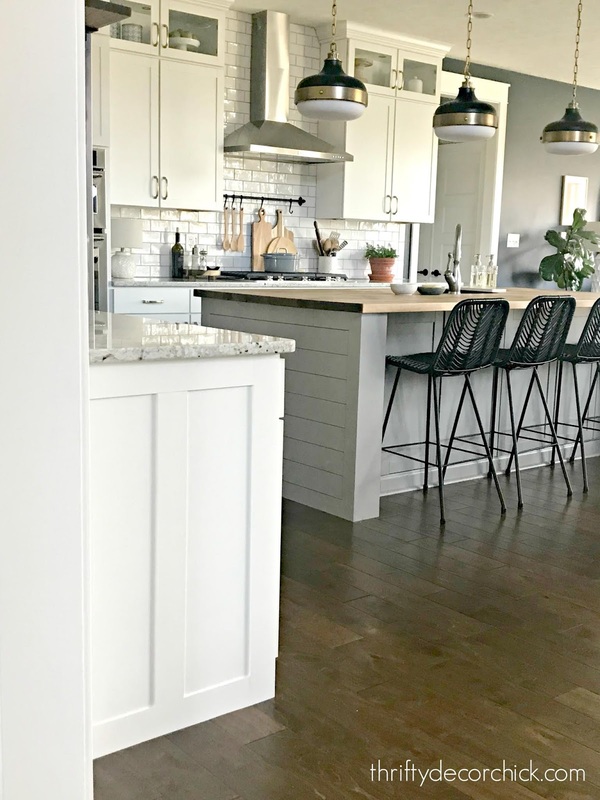 When I redid our kitchen island, I kept the old trim I removed to use on this project. I created a very simple board and batten look on the ends. Two on the sides first (so there was a clean look along the front) straight to the floor. Then the two pieces on top and bottom, and then the middle one. You could do anything here! Beadboard would be lovely. I could have gone with a planked look like the island, but didn't want to repeat it too much. 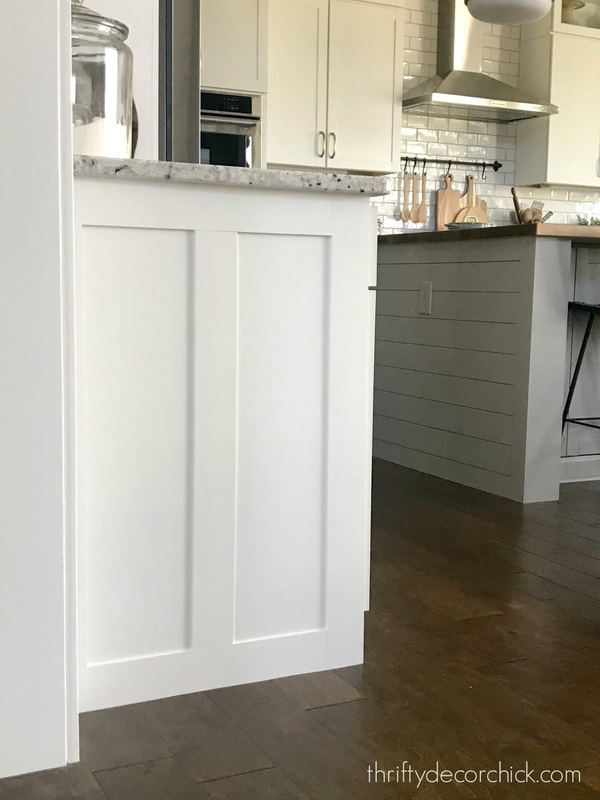 I started painting it with white paint and then I realized our white cabinets are not bright white (which I expected) -- so I took a door to the paint store and had it color matched. It's such a lovely, creamy white. I love it! I sanded lightly after each coat and did three coats total. 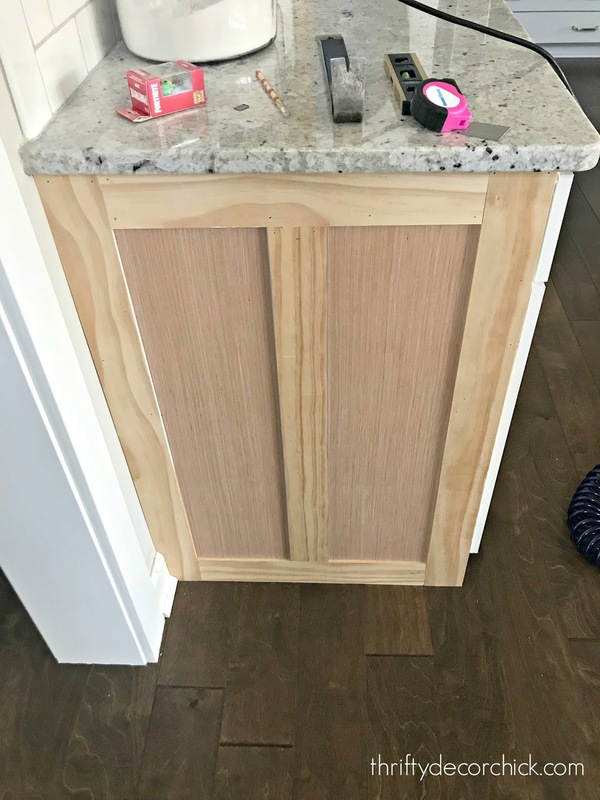 I LOVE how it makes the cabinets look more custom! It's a pretty detail that's subtle -- again, not in your face. I don't know that anyone would even notice the change if they came in the house, but overall it adds a little something. Yes, I covered most of this one up with the IKEA bracket and my cute kitchen stuff, but the end of the cabinet is still a beauty! I did both exposed ends for about $30. The 4x8 luan is plenty for this small project, and I have a bunch leftover. I had some of the 1x3 trim and bought a couple more. I don't count the paint because I'm using that for other projects in here. ;) More to come soon! 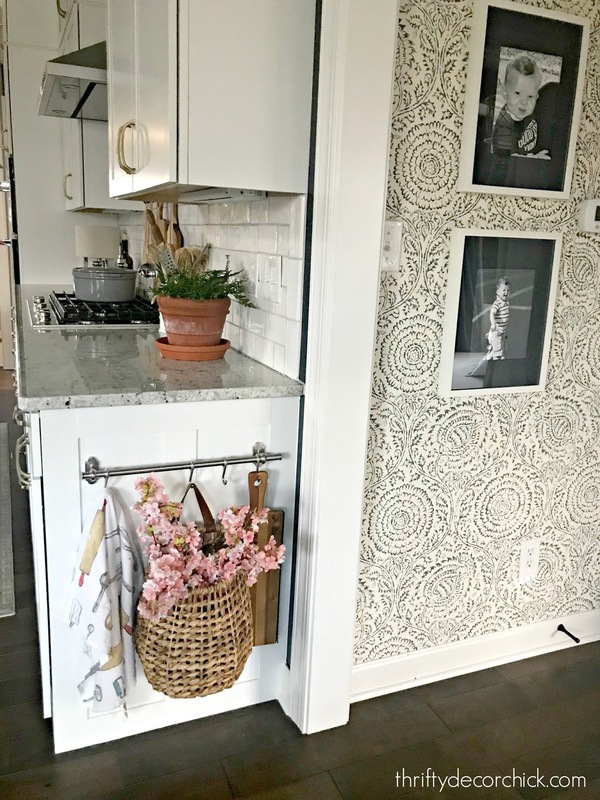 Have you tried a simple project like this in your home? I plan to do the same to the ends of our bathroom cabinets too. I can't wait to show you what's next! Beautifully done, as always! Looks as good as new and I love how you added the functional rod at the end for hanging things too. Love the simple but elegant look. I was so worried when you got a new home what would you do. I am thrilled at the small changes that make it so you. Love this blog. So pretty and simple, but just the right touch! Question: When you do board and batten or plank, do you not put quarter round or baseshoe back on? Thanks for all your great projects over the years. You can! I prefer it without, it just depends on what you like! I love this! 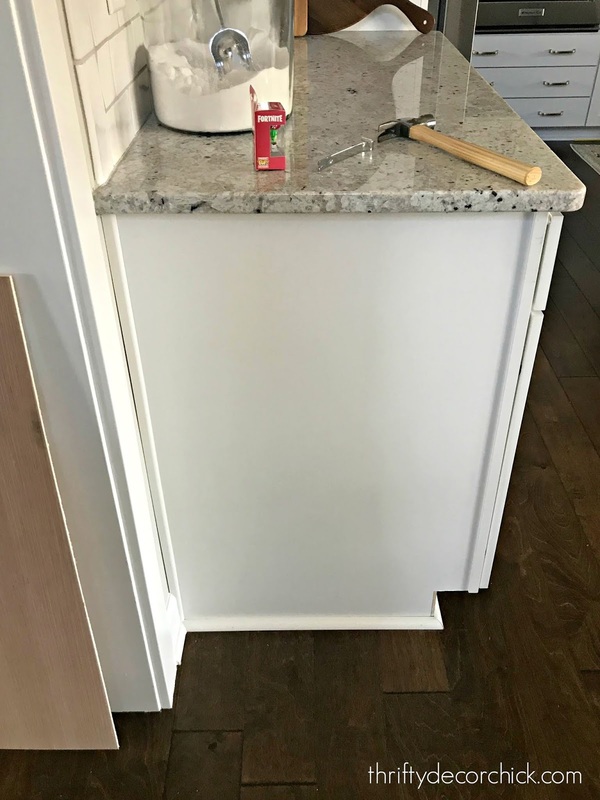 Could you please share how you were able to get the vertical piece on the left-hand side to so beautifully match the shape of the baseboard at the bottom? Did you have to make a template somehow of the baseboard silhouette? I'm having trouble figuring out how to do this well and it's stopped me from adding similar wall detailing in my home. Looks great, now you need to finish the uppers as well! Hi! Can you share where that wallpaper in the last pic is from? I love it!